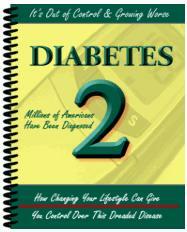 Fructose, which has no influence on the release of insulin, is metabolized in the liver (A). Which metabolic pathway is used depends on the presence or absence of other monosaccharides. In case of simultaneous supply of glucose and fructose, fructose is transformed into intermediate products of the glycolytic pathway. Since only one phosphorylated product results from the splitting of fructose-1-phosphate, the remaining glyceraldehyde has to be processed via a different pathway first. Like insulin, fructose activates a number of key enzymes required for fatty acid synthesis, thereby ensuring conversion of acetyl-CoA formed during glycolysis into fatty acids—even in the absence of insulin. If fructose is the sole carbohydrate, or if glucose supply is very low, an altered fructose metabolism results; fructose is still broken down into glyceraldehyde and dihydroxyacetone phosphate in the liver. 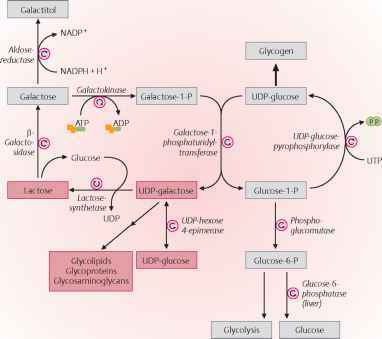 Then, however, these metabolites are used to synthesize glucose or glu-cose-g-phosphate through reversal of the first part of the glycolytic pathway. 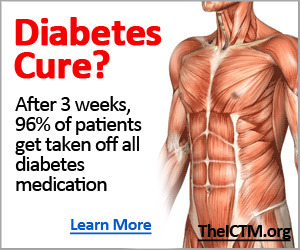 This permits blood glucose levels to be maintained and/or to replenish glycogen storage. Since this reverse glycolytic reaction is subject to "strict regulation," the amount of fructose that may be converted to glucose is limited. One problem with the uptake of large amounts of fructose is the decrease of hepatic ATP due to rapid fructose phos-phorylation. This interferes with other important liver biosyntheses, like protein biosynthesis. At the same time, there may be increased AMP breakdown, which may result in an increase of plasma uric acid. Lactate may also be formed, due to the cells' reduced ability to regenerate NAD+ from the NADH formed during fructose glycolysis. Depending on the type of nutrition— and particularly during childhood— large amounts of galactose from lactose hydrolysis end up in the bloodstream (B). Galactose has no influence on insulin secretion either, and practically all of it ends up in the liver after intestinal absorption. From there, it can be shuttled into glucose metabolism through conversion into uridine phosphate glucose (UDP-glucose), or used for the synthesis of glycolipids and other structural polysaccharides as UDP-galactose. In the mammary gland, this reaction can be reversed, with lactose forming from glucose via UDP-galactose. Increased plasma galactose levels occur in some neonates due to a congenital metabolic defect (galactosemia). They lack the transferase needed for further processing of galactose-1-phosphate. Subsequently, galactose is reduced to a sugar alcohol, galactitol—a neurotoxin that causes cataracts. Where is fructose and galactose converted to glucose? What is galactose converted to in the liver?